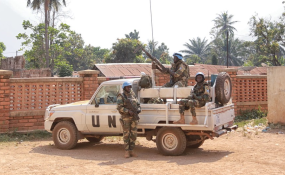 Peacekeepers from the UN mission in the Central African Republic (MINUSCA) on patrol in the country's capital, Bangui. Amid a recent uptick in violence in the Central African Republic (CAR), United Nations Secretary-General António Guterres on Saturday said he stood in solidarity with the crisis torn country and warned that attacks against defenseless civilians and UN 'blue helmets' may amount to war crimes. "The Secretary General is greatly concerned at the rise in violence in recent days in the Central African Republic," said a statement issued by UN Spokesperson Stéphane Dujarric. Mr. Guterres was reacting to an attack that took place this past Thursday, 15 November, on a camp for internally displaced persons in the town of Alindao, some 300 kilometres east of the capital, Bangui. At least 37 people were killed. The attack was attributed to the UPC (Union for Peace in the Central African Republic) armed group. In a separate attack yesterday on a base of the UN Multidimensional Integrated Stabilization Mission in the country, known as MINUSCA in the southwestern town of Gbambia, a Tanzanian peace keeper was killed. The attack is suspected to have been conducted by the Siriri armed group, the statement said. UN peacekeepers were protecting civilians seeking refuge in its camp as the village of Gbambia was attacked. The Tanzanian 'blue helmet' was wounded in the attack and later succumbed to his injuries. "The Secretary-General offers his deepest condolences to the families of all the victims, as well as to the Government of the United Republic of Tanzania. He stands in solidarity with the Government and people of the Central African Republic," said the statement. The UN chief went on to recall that attacks against UN peacekeepers, as well as against defenseless civilians, may constitute war crimes. He called on CAR authorities to investigate them and swiftly bring those responsible to justice. "The Secretary-General reiterates the determination of MINUSCA to protect civilians and to contribute to the stabilization of the Central African Republic," the statement concluded. CAR has been grappling with violence since fighting between the mostly Christian anti-Balaka militia and the mainly Muslim Séléka rebel coalition broke out in 2012. While a peace agreement was reached in January 2013, rebels seized the capital of Bangui that March, forcing President François Bozizé to flee. With the protection of civilians as its utmost priority, Chapter VII provides for the use of force - meaning, with Security Council authority, peacekeepers may respond to acts of aggression in kind.